Diamond TSable is the mare I dreamed of for over 30 years. Her dam is a daughter of Seraja, US Top Ten English Pleasure horse & perhaps the best daughter of Aristocrat Mare Fadjura, dam of 5 Champions and also dam of my beloved first Arabian, Thunder Magic. TSable carries two crosses to the beautiful Diamond TSioux, a stallion that I loved, and who was a grandson of the wonderful mare Bint Fersara, full sister to Ferzon ... my beloved Magic was also a Bint Fersara grandson. 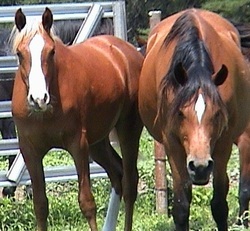 Silver Satinn ("Amy") is a wonderful mare of "old Polish" and Crabbet breeding, who produced 3 excellent foals for me. Her sons Dillonn (2006) & Dustinn (2008) are athletic young geldings with great futures ahead in endurance, show, sport horse, working Western & pleasure riding; her daughter Rosie (2007 - shown) should be "all that & more," with great potential as a broodmare, too. Thanks to Bill Harrison of Nacogdoches Boys Ranch for allowing me to purchase the sweet & lovely Amy, in 2004.